Yeehaw! Welcome to Blazing Saddles Hawaii! ​At Blazing Saddles Hawai‘i, we do line dancing, two-step, waltzes, swing, and more on Tuesday nights! Free dance lessons (6:30-7:00 pm) and lesson review (7:45-8:00 pm)! Monthly parties! Beginners welcome! We provide a fun and friendly social dance environment for Hawaii's diverse community (gay, lesbian, bisexual, transgendered, straight). 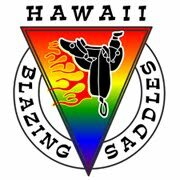 Blazing Saddles Hawai‘i is a 501(c)(7) nonprofit social organization. All events include music, dance, and refreshments and are smoke free! No entrance fee. Donations are gratefully accepted and help us pay for venue rental and monthly parties. Come on down and join us! If there are any changes to the schedule, they will be reflected here, and notifications will be sent to members via our listserv, Facebook, and MeetUp. If you are not on one of these, we encourage you to join.